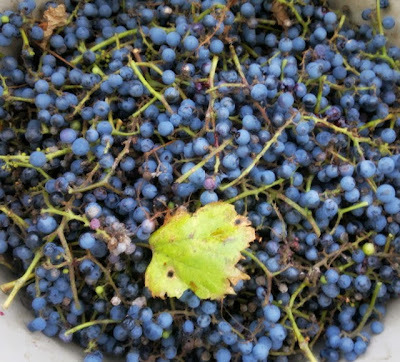 Another first for me this year was getting a harvest from the two large wild grape vines that are on the farm. There's one just on the fence behind the chicken's barn and another right at the back of the farm, sprawling over a hedge. The grapes are very small, about the size of a pea, but I thought I should make use of them somehow. On my first excursion I picked six pounds. After all that picking my hands looked liked I'd been taking part in a massacre. I also went into the orchard and harvested this year's apple crop. Only five pounds of apples, but better than nothing! Most of them were from a tree called 'Lady', which is an old French variety which produces teeny tiny apples (fit for a lady's delicate hand. Sigh. I'm clearly no lady.). Here's a close up of a few 'Ladies' with a couple of the more normal-sized apples for comparison. With all this Lilliputian fruit, the one thing I decided fairly early on was that I wasn't going to spend hours picking every grape off the stems and peeling and coring each of those tiny apples. Making jelly seemed like the obvious choice, as it involves straining the fruit after it has been cooked, so you don't need to worry about unwanted pips and stalks. Then, under a second later, the precariously-balanced colander collapsed into the bucket with an almighty splash, leaving my kitchen floor and cupboards as further evidence of a terrible, bloody crime. Since I was standing there with camera in my hand, I recorded the scene. I should have accepted that I was dealing with some bad jelly-making juju, but instead I persisted, boiling the juice with sugar and pectin. It never set properly: I now have several jars of a sort of runny wild grape syrup to show for all the hard work. It tastes alright and I think it will be OK on ice cream or pancakes, but it wasn't quite what I was hoping for. I think there was too much water in the mix and probably not enough pectin. Unwilling to admit defeat, I tried again today, this time boiling down the apples and using their juice and the juice from another pound or two of cooked grapes. I added more pectin than I did the first time and it seems to have worked - it's possible to turn the jars upside down without the jelly collapsing onto the lid, in any case. Will I bother again another year? 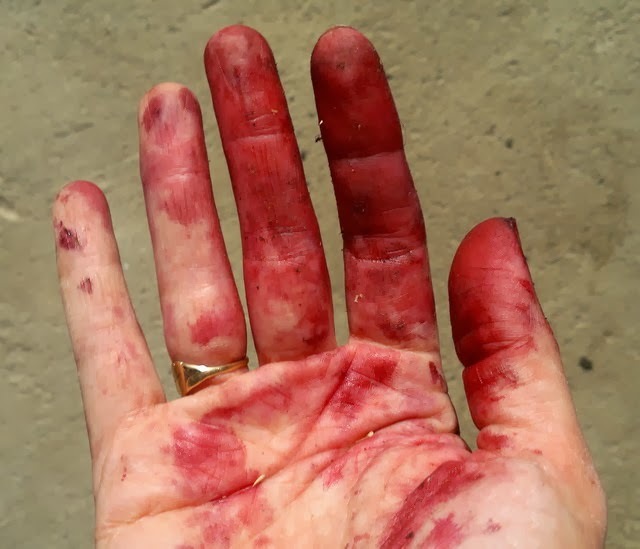 Probably: I really enjoy the process of harvesting wild food and I can see that turning the grapes and apples into jelly could become an autumnal ritual. Maybe next year I'll manage it without the added ambiance of a ritual killing. Your accident with the splashes looks like the kind of thing that happens in my kitchen with sad frequency! I admire your tenacity, though. This year I actually tore down a lot of grapevines in order to create a little vegetable garden, but there are still some left for the wildlife. I hope your heard-earned jelly (and syrup) is delicious! For draining jelly mash I recommend using an old pillow case. I put a hook just above the kitchen sink and I set the bucket in the sink and hang the bag above it. This works best at the end of the day when you don't need in the sink for several hours. Last year we made juice with our wild grapes. It required several strainings over a few days to get all the tartrate out in order to prevent bitterness. But it's yummy.